Now for the more full explanation. When I first discovered the tradition of family worship, it was a real breakthrough for me and my family. Although it took a while to get past the awkwardness of the moment, since we had not done this before, it is well worth the effort. But to start off, we need to keep it very simple. First, plan to have family worship after the evening meal. It is usually the best time to accomplish this because everyone is settling down for the evening. If you do not eat together as a family, then start doing it. If you want to pick one night, pick Saturday night to start, and that way you are connecting your Saturday evening into your Sunday worship. As you do this, you can expand to other nights. But as you begin, do not do it every night. You are setting yourself up for failure. Second, read through a good book. My suggestion is the Jesus Storybook Bible. We read through this book as a family, and I love it. Guess what…so did my kids! The great thing about this book is it explains stuff. So this will take away the initial worry of trying to explain a Bible passage that you do not understand. And as you read this, your kids will start asking you to read it after every meal, not just the Saturday evening meal! They will want to finish that book and go onto to more books. After the Jesus Storybook Bible, tryThe Big Picture Story Bible and The Child’s Story Bible. 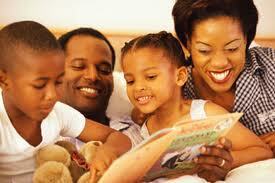 Third, once you finish reading the book, say the Lord’s Prayer together as a family. Make sure you say it the same way (i.e., debts or trespasses), but just say the Lord’s Prayer. Over time, you can add to this, but in my opinion, this is the best way to start at first. So here you go: after you finish your Saturday evening meal, pull the book out, say you are going to read a short chapter about the Bible to get everyone reading for worship on Sunday. Read it. Pray the Lord’s Prayer as a family. As you advance at this, you can add more to it. I noticed that Tim Challies pointed to a website with lots of resources. Joel Beeke has a short booklet on this topic, and Terry Johnson’s book on the subject is very good and comprehensive; he will direct you to other resources as well. But whether you are starting out or have been doing this for a while, don’t make it into a burden. You will defeat your purpose if you treat this as a strict discipline. Your kids need to enjoy this, and if you include them and keep it simple at first, they will help you build it into more.